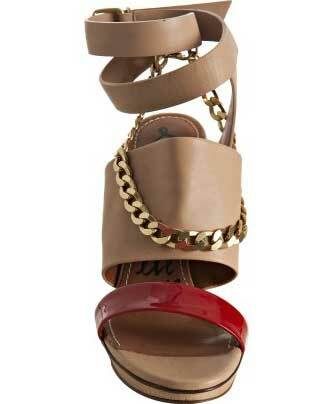 Rose leather chain detail wrap platform sandals, with glossy red strap over rounded open toe. Soft and supple wide leather strap over vamp. Goldtone chain over ankle. Buckle close strap wraps at ankle. 4½” ombré lucite covered heel with metal end, ½” front hidden platform.